The Oswego West Pierhead Lighthouse was built to improve upon and replace the existing lights of Oswego's harbor in 1934. The Lighthouse, still an active aid to navigation for Lake Ontario sailors, is representative of the City of Oswego and its rich maritime history, culture and heritage. Built as part of an extensive harbor enlargement project that involved the construction of elevators by the New York State Barge Canal, new breakwaters and enlarged anchorage, the West Pierhead lighthouse marked the new entrance to the harbor. Designed by the Superintendent of Lighthouses, 10th District of Buffalo, NY in 1932-33, the Lighthouse was placed at the end of the stone breakwater one-half mile out into Lake Ontario which required special engineering to withstand the high winds, heavy surf, and destructive ice common to the Lake. The St. Lawrence Seaway, which was completed in 1959, opened the Port of Oswego and its elevators to larger ocean-going freighters further enhancing the need for continued reliable aids to navigation. The West Pierhead Lighthouse was automated in 1967 - ending the era of light keepers at this station - and in 1995 the Fourth Order Fresnel lens was removed and placed in the care of this Museum. Tragedy struck the Oswego West Pierhead Lighthouse on December 4, 1942 claiming the lives of six Coast Guradsmen. During a drawn out period of bad weather, the Lighthouse ran low on food, oil for the lantern, and other provisions required to keep the crew and light operating. An attempt was made to rotate crew and resupply the Lighthouse. A 30-foot boat arrived in heavy surft and successfully exchanged crews, however, upon attempting to return to shore the vessel struck the west breakwater of Oswego's harbor resulting in a loss of control forcing it toward the east breakwater where it overturned. Only two crew members were able to climb onto the east breakwater. A second vessel attempted a rescue, but it also capsized with, again, only two crew members reaching the east breakwater. 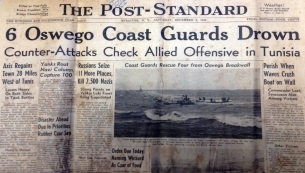 The four crew members who reached the wall were rescued, but the remaining six drowned - of which only four bodies were recovered. The Museum is dedicated to honoring and remembering all those who have and do continue to serve in the protection of our waterways. The Restoration - Upon being automated in 1968, there was no longer a need for keepers or a manned presence at the Lighthouse. Although this required the maintenance of the automated light and the accompanying light tower, the unoccupied building fell into disrepair given the lack of continued maintenance required to upkeep such a structure. In 2000 the Lighthouse was placed on the National Register of Historic Places. In 2006 the structure was deemed excess and made available, and in 2009 was aquired by the City of Oswego from the United States Coast Guard to continue serving as a historic and cultural symbol of the City. 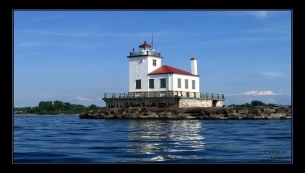 In 2010 the Oswego Lighthouse Development Committee was formed to plan the restoration efforts. The first structural survey was completed in 2011 that allowed for the restoration of the Lighthouse to progress. 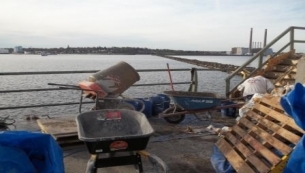 In 2012 the Committee developed a plan for the remediation of hazardous materials and improvements in the safety features of the structure - the remediation was sucessful completed in 2012 removing asbestos, bird guano, and other materials from the site. Restoration of the interior began in 2013, and has been ongoing since with the repair of the plastered walls, painting and the installation of a usable head for volunteer workers. In January of 2014, the H. Lee White Maritime Museum acquired a lease of the Lighthouse from the City of Oswego to expedite the restoration process. Exterior restoration, the next phase of the restoration process, has been studied along with plans for safe visitor access and security during the 2014 year. It is our goal to promote, create safe access, and to make the Lighthouse suitable for visitation. To learn more about volunteering, or the many ways you can participate in this project, click here to visit our support page.